The residents and staff of Brookdale Urbana invited Urbana Fire Chief Mark Keller and staff, Urbana Police Chief Matt Lingrell and staff and county Emergency Management Agency Director Kip Michael to a Hero Appreciation Breakfast on Sept. 11 to thank them for all they do. From left are Fire Chief Mark Keller, Police Sgt. John Purinton, Police Lt. Seth King, Police Chief Matt Lingrell and Police Officer Todd Burkett. https://www.urbanacitizen.com/wp-content/uploads/sites/36/2015/09/web1_Police-Fire.jpgThe residents and staff of Brookdale Urbana invited Urbana Fire Chief Mark Keller and staff, Urbana Police Chief Matt Lingrell and staff and county Emergency Management Agency Director Kip Michael to a Hero Appreciation Breakfast on Sept. 11 to thank them for all they do. From left are Fire Chief Mark Keller, Police Sgt. 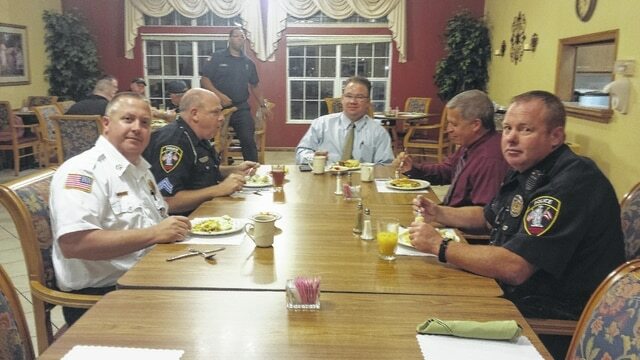 John Purinton, Police Lt. Seth King, Police Chief Matt Lingrell and Police Officer Todd Burkett.